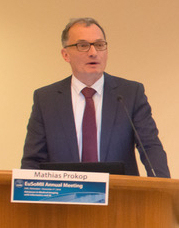 November 7, 2018 -- Many aspects of imaging are dull and should be automated, Dr. Mathias Prokop told delegates at the annual meeting of the European Society of Medical Imaging Informatics (EuSoMII) on 3 November. Artificial intelligence (AI) will create the space and time for radiologists to concentrate on what really matters, he said. So far, however, few AI products do as they promise. He pointed to bone age determination programs as one of the rare AI tools used routinely and effectively in many centers. This small application holds the basic ingredients for success, according to Prokop, who is professor and chair of radiology at Radboud University Nijmegen in the Netherlands. Now, the deep learning industry is focusing on areas involving huge volumes of data such as breast and chest screening. "We are close to using AI in screening but there are certain issues concerning regulation and best use that need to be addressed," he said. "Companies have usable high performance AI products that are competing for the breast screening market." A key problem with AI remains the issue of blame when something goes wrong, Prokop told attendees at the EuSoMII meeting, held at the Erasmus Medical Center in Rotterdam. Regulations will have to define what the patient can expect from the use of AI and who is ultimately responsible for mistakes, such as false negatives and false positives. "There needs to be some general agreement between stakeholders. Even if mistakes are only made in 2% of AI diagnoses, lawsuits could be extremely costly. The system needs to keep within regulation and buffer risk for the companies, perhaps through patients signing a waiver," Prokop suggested. At the moment, AI's strength lies in detecting and categorizing frequent pathologies. Lung nodule CTs provide much training data for algorithms. However, data is sparse at the periphery of the domain, for example in rarer pathologies, such as cancerous cysts. Disease presentation overlap can also hamper machine identification. Another pitfall is technical variation. Radiologists need to know that the systems are robust enough to deal with images from different scanners, with different doses, or with reconstructed images. So how sure can radiologists be the system will be making a reliable diagnosis? The answer lies in ensuring that systems are trained using data pooled from multiple countries and institutions, particularly for rare diseases and rare disease presentation, he said. As the mandate for operational excellence, high throughput, and streamlined services intensifies, radiologists will increasingly rely on AI, Prokop continued. At present, AI in radiological image analysis mainly focuses on the two ends of the diagnostic spectrum: programs for niche areas and those for large screening application, and similarly, programs trained to identify common lesions or conversely to detect rare presentations, according to experts at the session Cases of AI in Medical Imaging. Furthermore, radiologists will have to discern which AI tools will be clinically or operationally useful in daily routine, and this may be through trial and error in the clinical setting. "Radiologists are trained to be expert image interpreters but increasing operational pressure is shifting the focus toward high throughput rather than maximizing quality," Prokop said. "Our performance is no longer only measured by the quality of our interpretation but by the quantity of our main product: the radiology report. We are pressured into crunching out as many as we can, as quickly as possible, ideally without losing diagnostic quality." Presenting the keynote lecture, during the session on Cases of AI in Medical Imaging, he told delegates that radiologists were caught up in a factory worker paradigm with more than 50% of doctors showing at least some signs of burnout, according to statistics presented at the RSNA 2017 meeting. He added that while new technology would improve the solution, some techniques were slipping away from radiologists due to the delay in AI's development. In a routine imaging technique like CT, any new development that takes longer to perform and eats into reporting time is not being supported by most radiologists, unless evaluation can be automated, according to Prokop. The result is that clinicians are starting to take on the new techniques faster than radiologists and the techniques are proving to be the engines pulling radiological progress forward, more so than the radiologists pushing it from behind. Quantification of interstitial lung disease and CT perfusion of the brain are cases in point, Prokop noted, adding that clinicians and interventional radiologists were the driving force behind adoption of these two techniques in clinical routine. He believes many radiologists are growing out of touch with what clinicians want, thereby jeopardizing their leading role in pushing diagnostic capabilities forward. He flagged the Response Evaluation Criteria in Solid Tumors (RECIST), especially the newer variants evolving with novel immunotherapies, as an example where many radiologists have let clinician take the lead. "Quite a few of us have no idea how to interpret response to various novel immunotherapies for solid tumors using RECIST," he told AuntMinnieEurope.com. In addition, recent research proving that CT perfusion of the brain in ischemic stroke workup influences outcome means that clinicians are now debating whether to use it routinely for triage. "The point here is radiologists pushed this new technique for a while but clinicians didn't pick it up. Clinicians need clinical data before they change practice habits. Once they knew that CT perfusion impacts outcome, then they wanted it. The irony is that radiologists are less prepared to use it due to it taking longer," he said. Saving time in specific tasks is where AI should prove its worth, Prokop noted. He also warned delegates that much would be learned about the weaknesses of AI, only after they were implemented in routine clinical use. This would trigger a second "hype" cycle that eventually would result in AI products that truly worked, he noted. "Some products will be useful for clinical practice, and some won't be. There is likely to be a big shake out of the companies making clinically useless programs over the next five to six years," he said. The question of when the second AI "hype" cycle will begin has no simple answer, according to Prokop. He believes a lack of support from big companies has acted as a brake on development to date, but true breakthroughs in clinical routine are imminent. In three years' time, AI systems will be used in big screening scenarios, rather than purely in the existing small domains seen today, he stated. "We -- and industry -- need to ask, what are the routine tasks that we don't like and how can we complete these quickly with AI? We are looking for systems that will support us so that we can optimize our real skills as radiologists," he said.